If its your Birthday, you are entitled to a free Birthday model from me. I used to follow all the Birthday threads...I don't any more. Nothing meant by that, just can't keep up with every post, every thread, etc. 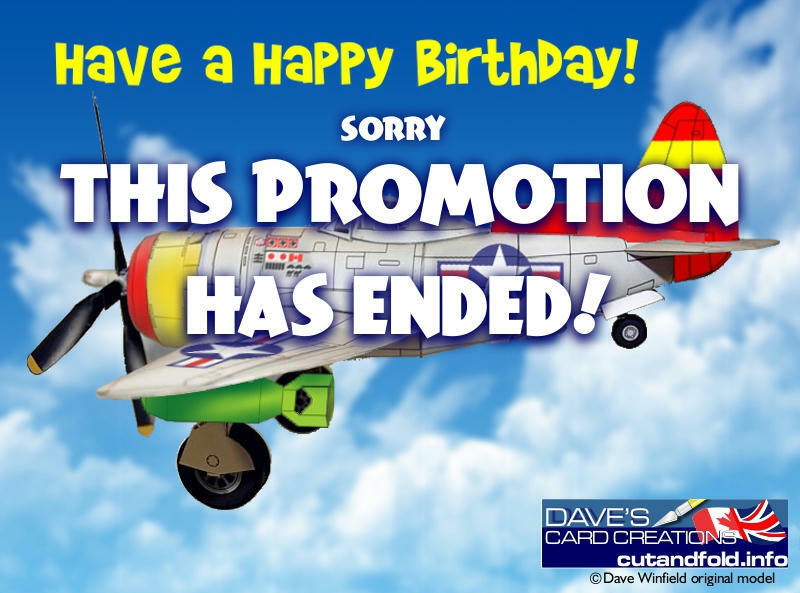 So, I am not going to be going into every Birthday thread offering a free model. Just know, that I wish you a Happy Birthday and if you want a free Gift its yours. Please send me an email, AND if you need more more reinforcement, read the entire thread, but still send me and email..
and say "Wheres my Birthday Model?!" You can pick from just about any single model in my shop. Feel free to pass this along to anyone here having a Birthday, in case I don't visit their thread. Tell them to come get their free kit. This includes veteran and newbie members, I don't care. The more kits I circulate, the more it rewards me as well. Last edited by rickstef; 03-07-2019 at 07:16 PM. That could become the first paper plane I will build! Thanks!!! That¡s a nice gesture. Very generous. Sounds like a win-win for everyone. Thanks, Dave. I'll check in next 20 September. I'm sure there are many whos Birthdays have just passed! If I did it for you, I'll have a dozen others saying "oh my Bday was just last month!..." I have to start somewhere so I am going to start with yesterday's gift to Herky. I'm sorry we just missed your Bday, but make sure you come see me next year! I tell you what...you have my special permission to grab an EXTRA KoolWheelz model today. I've never given that to anyone else! How ever many KoolWheelz models you feel like grabbing...take one more, on me! Dave, that's a generous and gentlemanly gesture. Bravo! Dave - a very nice gesture. Speak to you on the 4th of July! Quite generous of you. I'll say thanks 9 months early.